Wycombe Wanderers have been on a quite superb run of form recently, turning themselves from League Two strugglers into genuine top three contenders this term. It hadn’t looked even remotely like that was going to be the case in the early stage of the season as the Chairboys only won one of their opening seven league matches. In fact, when beaten 4-1 by Luton at Kenilworth Road on September 3, it saw Gareth Ainsworth’s side languishing just one place above the relegation zone, some 12 points adrift of the Hatters already. The Wycombe boss always stuck to his belief that once his injured players returned it would lead to an upturn in fortunes, as it would prove, with a 1-0 win over Stevenage on September 17 unearthing some green shoots of recovery, with Crewe thumped 5-1, in a sequence of three wins from four. October was tough once more though, as Wycombe went four matches without a win, until a surprising 2-1 triumph at Portsmouth in the FA Cup. That was followed by a 4-2 home defeat to Coventry in the Checkatrade Trophy group stages, before the corner was well and truly turned, in some style too. Wanderers defeated Morecambe 2-0 on November 12 and haven’t looked back since, with eight straight wins, seven in the league, only ended by a 3-3 draw at Plymouth recently. Ainsworth’s side bounced back to win the next three games though and also knocked Blackpool out of the Checkatrade Trophy on penalties, as a 1-1 home draw with Yeovil last weekend stretched their two month unbeaten run to a hugely impressive 14 games in total. A lot of that is down to the form of December’s League Two player of the month, striker Scott Kashket, whose tally of 13 goals in just 16 games, has led to the signing of a new long-term contract at the club. Ainsworth has kept his powder dry in the transfer window so far though, allowing goalkeeper Scott Brown to rejoin former club Cheltenham on loan and agreeing a new contract with centre-back Max Muller. Team news: Luton will be without Alan Sheehan for this weekend’s trip with the defender suspended for his sending off at Crewe. However, Glen Rea is available after his ban, leaving Cameron McGeehan (broken leg), Dan Potts (knee), plus long-term injured duo Danny Green and Nathan Doyle as the only absentees. Top scorers: Hatters: Danny Hylton (14). Alex: Scott Kashket (13). 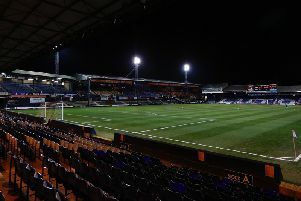 Man in the middle: Mark Heywood - official took the 1-1 draw with Carlisle recently at Kenilworth Road in a game full of controversy, as he allowed the visitors’ time-wasting tactics to spoil the match. The official failed to send off visiting defender Shaun Brisley for a clear second yellow card, and then dismissed Michael Raynes for elbowing Danny Hylton, before the decision was surprisingly rescinded afterwards. Has taken 23 games so far this term, showing 104 yellows and three reds, while sent off seven players last season in 27 matches, with 91 cautions too. Assistant referees are Steven Plane and Louis Marks, with Dave Bushell the fourth official. In charge: Gareth Ainsworth - 43-year-old former midfielder, who started out at Blackburn Rovers and had spells with Northwich Victoria, Preston North End, Cambridge United, Lincoln City, before a £500,000 move to Port Vale in 1997. Headed to the Premier League when he joined Wimbledon for £2million a year later, before moving to Cardiff in 2003 and then QPR where he spent seven years, twice serving as caretaker-manager. Joined Wycombe in February 2010, following a short loan spell and was appointed player manager in November 2012 following the sacking of Gary Waddock. Has now been in charge for over four years at the Causeway and although hung up his boots in April 2013 to concentrate on his managerial duties, came off the bench for five minutes in the 3-0 Checkatrade Trophy win at Northampton in August, his first appearance since the 2012-13 campaign. Currently the fourth longest serving manager in the top four divisions, behind just Arsene Wenger, Paul Tisdale and Jim Bentley. View from the dug out: Gareth Ainsworth: “These are all huge games now. Luton are one of the best sides we’ve played this season. “It’s always a good derby. I’ve got a lot of respect for Nathan Jones; we had many good battles on the pitch as players. One to watch: Scott Kashket - 20-year-old striker was released by Leyton Orient in the summer after two years with the O’s heralded just the one goal from 22 appearances. Had a fruitless loan spell at Welling, but on leaving Orient, was snapped up by Wycombe and notched twice in the 5-1 win over Crewe, on his second game for the club. Has flourished since, with another brace in the 2-0 win over Hartlepool and bagged a hat-trick in the 5-0 thumping of League One Chesterfield in the FA Cup too. Went on a run of scoring in four straight games afer that as well, netting a hugely impressive tally of 13 goals in just 16 games so far. Played for both: Scott Rendell - Experienced striker, now 30, who began his career with Aldershot in October 2003 and had spells at the likes of Cambridge and Peterborough, before moving to Wycombe in July 2013. Spent two years with the Chairboys, scoring 20 goals in 54 games, before then Luton boss Paul Buckle brought him to Kenilworth Road. Went on to find the net 12 times in 46 games for the Hatters, including most famously, the winner when Town knocked Premier League Norwich City out of the FA Cup at Carrow Road. Went to Woking when he had a prolific spell of 41 goals in 75 league games, but a nasty knee ligament injury saw him out of action for a whole season. Left the Cards in the summer to return to Aldershot and has notched 10 times in 26 games so far. Friendly faces: Wycombe defender Michael Harriman spent eight months on loan at Kenilworth Road during the 2014-15 campaign, making 39 appearances, scoring twice. Had been hotly tipped to return to Luton on a permanent basis, but a deal couldn’t be reached and he rejoined former side Wycombe in the summer of 2015, going on to play 77 times, scoring eight goals since. We’ve got form: Luton are yet to taste defeat on their travels to Wycombe since their first trip in Division Two back in September 1996, when David Oldfield’s goal sealed a 1-0 win. In total, the Hatters have won six matches, drawing five, scoring 13 goals and conceding just five, keeping seven clean sheets in the process. The best win was an FA Cup clash back in December 2004 when Steve Howard’s double and Kevin Nicholls’ strike saw them to a 3-0 victory. Last time out: A Cameron McGeehan stunner saw the Hatters win 1-0 at Wycombe last season. The midfielder picked the ball up 25 yards out and half volleyed into the top corner just before half time to score the only goal of the game. Hatters: Elliot Justham, Stephen O’Donnell, Jake Howells, Alan Sheehan, Scott Cuthbert, Alex Lawless, Cameron McGeehan (Paddy McCourt 80), Olly Lee, Jack Marriott (Pelly-Ruddock Mpanzu 74), Craig Mackail-Smith, Joe Pigott (Paul Benson 63). Subs not used: Mark Tyler, Magnus Okuonghae, Jonathan Smith, Zane Banton.